FILE - The wrecked fishing boat that capsized and sunk on April 18, 2015, off the coast of Libya, lies outside a NATO base in the Sicilian town of Mellili, Italy, Oct. 8, 2016. Before their lives ended in an underwater deathtrap, before they lined up 100 to a row on a Libyan beach to board a boat with no anchor, the young men from the parched villages of the Sahel had names. Two forensic investigators, one crisscrossing Africa and another in a university laboratory in Italy, are on a quest against the odds to keep Italy's promise to find those names. They are tracing the identities of the migrants killed when an overloaded fishing boat went down off the coast of Libya on April 18, 2015, in the Mediterranean's deadliest shipwreck in living memory. FILE - In this Oct. 8, 2016 file photo, a woman walks past rows of coffins at the NATO base in the Sicilian town of Melilli, Italy, where forensic investigator Cristina Cattaneo is one of two investigators trying to keep Italy's promise to trace the identities of all the migrants killed when an overloaded fishing boat went down off the coast of Libya on April 18, 2015. The story of the fishing boat known as the peschereccio and its passengers reflects how migrants can simply vanish worldwide, sometimes without a trace. At a time when global migration is at an all-time high, The Associated Press has found in an exclusive tally that at least 62,284 migrants have died or disappeared worldwide since 2014. That's more than double the only official attempt at a toll, by the U.N.'s International Organization for Migration. But it is also a story of how difficult it is to document these dead and missing, especially at a time when there is no longer a political will to support survivors, let alone figure out how many migrants died and who they were. Back in 2015, then-Prime Minister Matteo Renzi committed Italy to giving names back to those who perished in the April 18 shipwreck. There was a "short period of sunlight," when Italian agencies worked together to recover the bodies and start the process of identifying them, according to Cristina Cattaneo, the Italian forensic investigator. "It was a magical moment," she said. Governments have since cut back on funding; rescue operations have ceased in the Mediterranean. Many Italians question the need to identify the bodies when they already have "a tomb at the bottom of the sea," said Roberto Di Bartolo, the engineer who led firefighters in the recovery operation. "But if this boat had not been full of people from Africa and instead they came from the United States, Australia or Japan," he said, "we would have done everything to get the bodies out and find their identity, to give names to those people, because they were people." The migrants on the peschereccio started their journeys in some 20 countries, from Bangladesh to the western tip of Mauritania, according to information from the two investigators, published accounts of survivors, Italian government documents, and families who fear their loved ones were among the passengers. Many came from Africa's Sahel region, where Senegal, Mali and Mauritania meet, walking northward or hitching rides in trucks. Cheikh Fofana's son called around that time to say he was leaving soon for Europe. Fofana warned him to wait for a big boat that might withstand the force of the sea. Surviving a vast ocean is nothing like escaping a tree-lined river, he said. 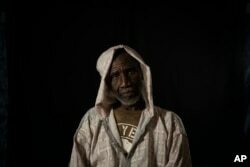 FILE - Cheikh Fofana poses for a picture before an interview in Goudiry, Senegal, Nov. 26, 2018. Fofana grieves his son, Tidiane's absence, even while refusing to officially acknowledge he is dead. "I told him not to take a makeshift boat, it's very dangerous, it's risky because the sea has no branches," Fofana said. His son, Tidiane, responded he had waited too long to cross already, but promised, "I'll try to take the big boat." Twenty-four bodies were fished out of the water and dropped off in nearby Malta. But Malta wouldn't accept the 28 survivors, who were then taken by the Italian coast guard to the Sicilian port city of Catania. The boat pulled up to the dock in the middle of the night, where a throng of volunteers tossed flowers at it and handed the survivors cellophane-wrapped care packages. Around this time, Fofana called his son's phone again. A stranger answered and told him Tidiane had left for Italy. The family visited several spiritual leaders, known as marabouts, hoping to learn Tidiane's fate. One said only that the son was in a "state of obscurity." "I know that if he is dead, there's nothing more I can do, by the will of God. But let me know, is he alive? Is he dead?" Fofana said, his lined face twisting in anguish. "This is the doubt that troubles me." Even before they rigged the pulley to the fragile frame of the boat, divers working 370 meters (1,214 feet) underwater placed a wreath of flowers on the waterlogged deck. The resurfacing operation took 20 hours — men leading it from the control room applauded when it budged from the seafloor. The navy's video aired on national television. That's when Italy's top pathologist, Cattaneo, arrived. So terrified of flying that she chose a 13-hour train and ferry trip to Sicily over a 90-minute flight, she was fearless when faced directly with death. As the firefighters donned hazmat suits against possible biological hazard, Cattaneo wore a T-shirt and jeans, her blond head bobbing amid the wreckage and bodies, a pair of latex gloves her only protection. Her confidence calmed them. "I found before me a carpet of human silhouettes that stretched out across the area of the hold ... almost all face down, some in a fetal position, many swollen with putrefaction, made human by their hair, gloves, sweaters and the shoes they had on," Cattaneo wrote in her book published earlier this month, Shipwrecked and Nameless. FILE - Cristina Cattaneo, right, and her team collect post-mortem data from shipwreck victims to obtain information for a future identification at the NATO base in the Sicilian town of Melilli, Italy, Oct. 8, 2016. The bodies were crammed five to a square meter (yard) — "like a slave ship," said Di Bartolo, the firefighter engineer. "Out of respect, no firefighter ever stepped on a body," Di Bartolo said. "We had to lie across them to pull them up, but we never walked on them." 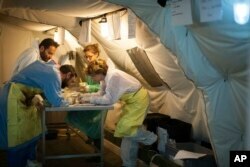 At Cattaneo's tent-lab, 50 pathologists and forensic investigators from 12 Italian universities worked in rotations, stretching the bounds of science to extract and sequence DNA from bodies or fragments that had been submerged in seawater for a year. On Dec. 13, the Tunisian captain of the vessel was convicted of manslaughter and trafficking and sentenced to 18 years in prison. His Syrian mate got a 5-year term. The peschereccio lacked an anchor, the "captain" had no idea what he was doing, and the vessel was too rickety to withstand the waves or the hundreds of men on board. U.N. and EU investigations later revealed that the head of the operation was a Libyan trafficker nicknamed "The Doctor," believed to have sent 45,000 migrants to Europe in 2015 alone, and infamous for his brutality and the flimsiness of his boats. He's never been apprehended. Also in December, Renzi — the prime minister who had kept his vow to retrieve the boat with remains — lost the confidence of Italian voters and resigned as Italy's leader. His departure contributed to the ascent of the fiercely anti-migrant Matteo Salvini. FILE - Cristina Cattaneo checks victims' personal belongings in a lab in Milan, Italy, Sept. 19, 2016. FILE - Jose Pablo Baryabar, a forensic anthropologist from the International Committee of the Red Cross, speaks during an interview in Paris, Nov. 20, 2018. "You cannot just tell them a story and you cannot misrepresent who you are. 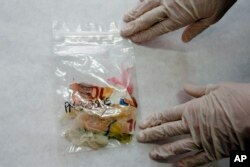 You're not there to bring them a body bag or give them money," said Baraybar. With the information he'd gathered, Baraybar was able to chart connections among the young men who headed north for a better life. He uncovered the names of relatives, friends, acquaintances and even traffickers from the Sahel as he sought an algorithm to predict where victims might have lived — and who might have been on the boat. That led him to his most recent trip to Senegal, where he confirmed crucial details about how the boat was loaded. Three of the rows of 100 migrants each waiting on the beach didn't make it on the boat, because a truck arrived carrying around 200 migrants from East Africa who had paid a premium to board first. "Families do matter," he said. "And not knowing kills." FILE - Mariama Konte, 20, stands inside her home in a village near Goudiry, Senegal, Nov. 26, 2018. Konte, who married Abdrahamane when she was 12 and he was 21, is living the consequences of the family's decision in November to mourn him after nearly four years of waiting. In Dougue, on dirt roads so empty that donkeys can rest in the street at midday without fear of a car, it's easy to spot the families whose sons work in Europe. They're the ones with the concrete houses, the metal rooftops and prominent satellite dishes. They have the largest herds of cattle and motorcycles, and their children are in school. Konte, who married Abdrahamane when she was 12 and he was 21, is living the consequences of the family's decision in November to mourn him after nearly four years of waiting. Friends and neighbors told them they would feel better if they went ahead with the ceremony, as five other families of the missing already had. So a few weeks ago, the family sacrificed a sheep, and she put on a lemon-yellow veil that marks her as a widow. She will wear the same clothes for four months and 10 days, washing only on Fridays. She will stay inside the family's compound and eat her meals alone. Then, by tradition, she will almost certainly marry one of her husband's brothers. "Each night I pray for him. I pray to God that he will find my husband," she said. "To find another husband is not hard but to find one like him is difficult." The peschereccio still sits with holes in its sides where the bodies were pulled out. Italy's government refused to pay for Cattaneo's plan to move it to Milan. In 2018, the number of migrants arriving illegally in Europe is set to reach its lowest level in five years; the number of dead is well below the levels seen when IOM started counting. Salvini, who is now Italy's interior minister and oversees the missing person's office, was uninterested in whether Renzi's promise had been kept. He credits the new government's hardline policies against rescue for deterring deaths this year. "You do not need a scientist to figure it out, that the fewer people depart, the fewer people die," he told The Associated Press with a shrug. Baraybar and Cattaneo say they are close to their first identification — a single name among nearly 1,100 dead in a single shipwreck — in a year that saw at least 211 boats sink into the Mediterranean. He describes it as nearly a "mission impossible." And then he presses onward, searching for families who have more questions than answers. His eyes widening almost past the edges of the round frames, he asks: "What kind of thing can you give back to these people that have lost everything?"